The flavor combination of kali dal ("black lentils" in Urdu) is simple: black lentils, ginger and a few chiles to enhance the flavors. In this case, simple is beautiful. 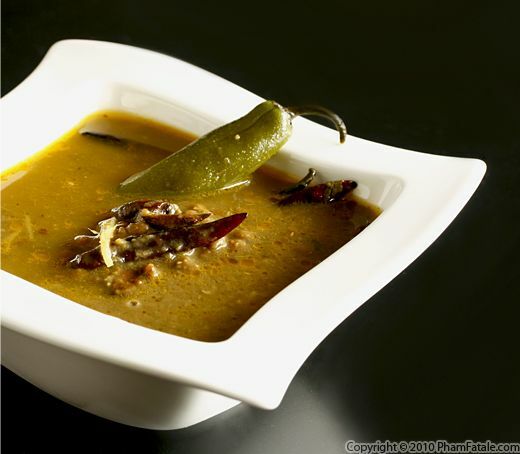 The dal is finished with a hint of acidity and tartness with dried mango powder. It is both tasty and healthy, especially if you're on a vegetarian diet and need the protein. Since I'm married to a vegetarian, I have had to educate myself about how to create nutritious meals that are meat-free. 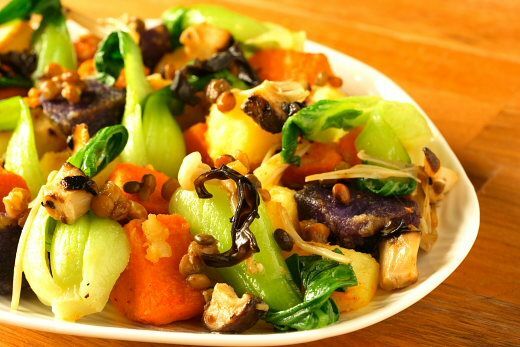 What I learned is that the basis of any well-balanced vegetarian meal is a starch and a legume. This isn't too surprising; almost every culture has a combination like this, be it rice and beans, rice and tofu or bread and chickpeas. I've personally come to really enjoy rice and dal, which is the Indian version of this combination. Black dal in particular have a wonderful earthy, complex flavor that is hard to describe and impossible to forget. At the very least, try them the next time you go to an Indian restaurant, or better yet, make them at home. It's definitely worth the effort. If you're familiar with French pâtes de fruit or fudge, you'll want to try the Indian / Middle Eastern equivalent, called halwa. Halwa literally means "sweet" in Arabic. It can be made with different ingredients such as carrots, pumpkin, yams, beets, semolina and many types of beans, lentils or nuts. Daddy (my father-in-law) had a craving for some chana dal halwa, so my mother-in-law made several batches this weekend. 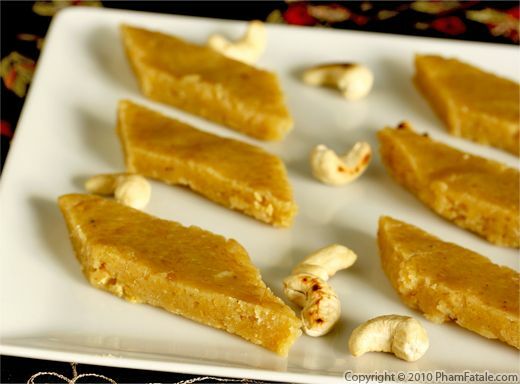 To the chana dal, she added roasted cashew nuts (Kaju in Urdu) for flavor and texture. This particular recipe also calls for a large quantity of clarified butter, or ghee. Ghee is popular in Indian cuisine and can be found at almost any Indian grocery store. This dessert is definitely not low fat or low calorie, but the taste and texture are extraordinary. Store-bought halwa cannot compare. We made a huge batch and stored them in tins in the refrigerator. The girls placed the sweet candy in cellophane gift bags and tied a pretty bow around them to give away to their friends and teachers. Whether or not you decide to share the dessert with others, you should definitely find time to make some. Your efforts will definitely be rewarded. Sunny had an orthodontist appointment today and she got tighter elastic bands on her braces. The poor thing couldn't chew solid foods. I had to make her something that wouldn't cause any pain, and after looking through the pantry I decided to make her a bowl of hot lentil soup. She loves hot and spicy foods, so I added some leftover harissa "ice cubes" (see tips) from the freezer to the soup to give it a kick and to complement the earthy flavors of the lentils. You'll enjoy this soup even if you haven't had recent dental work done. It's a great cure for the cool weather we've been having as well.